Robots, bears, laser swords and....free games! Dynasty Warriors: Gundam Reborn was released a few weeks ago on the PlayStation 3. The two player co-op game slipped under our radar, which is pretty hard when it contains 40 foot tall fighting robots. We haven't officially reviewed a Dynasty Warriors Gundam Game since the second iteration, but the 4th game in the series continues the trend of huge massive anime robot space battles. Destroying mass quantities of robots with a laser sword and a co-op buddy by your side is my idea of a good Thursday evening. We're giving away 10 copies of the game along with the DLC. Two 2nd prize winners getting a copy of the game and a sweet "Bearguy" modelkit. One grand prize winner will get a copy of the game and a "RX-0 Full Armor Unicorn Gundam" model kit. Winners must have a North American PSN account to redeem their copy. Apparently there's a big disparity in what you can name Gundams. 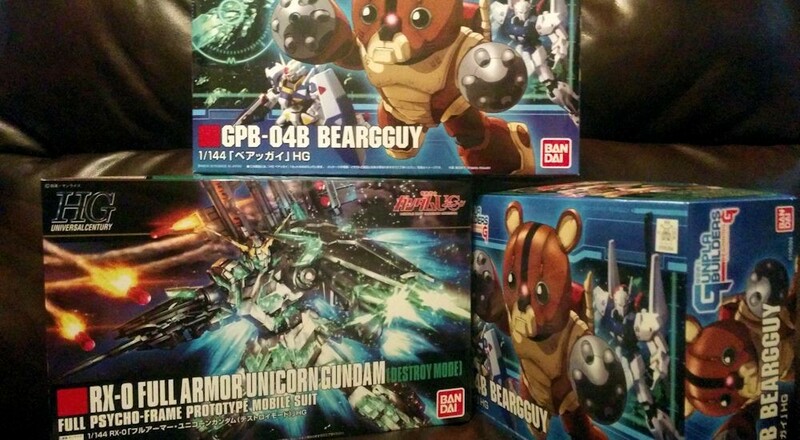 "GPB-04B BEARGUY" isn't quite as intimidating as "RX-0 FULL ARMOR UNICORN GUNDAM (DESTROY MODE) FULL PSYCHO FRAME PROTOTYPE MOBILE SUIT." My guess is the bear wins hands down. To enter to win just click the button below. You can enter once per day until the contest ends. Winners will be drawn on Monday, July 21st at noon Eastern. Good luck, thanks for visiting Co-Optimus and thanks to Bandai-Namco for sponsoring the contest. Page created in 0.6676 seconds.